A few weeks ago, we welcomed 5 sheep to the farm! For the last year Camille and I have been tossing around the idea of raising sheep or goats. Being totally new to raising either, we really weren't sure what route to go. I have been researching both animals with hopes that these ruminants could offer a solution to the overgrown plant life in some of the open spaces here on the property. Still undecided, it took an unfortunate accident to bring sheep into our lives. A good friend of the family had an unfortunate accident which left him unable to care for his flock, so we willingly took up the offer to purchase some of his sheep. These Katahdin sheep consist of 3 ewes, and two lamb. In a few weeks we plan to bring in a ram to hopefully assist in the baby making process ;) This particular breed felt like a wise choice, mainly because of their foraging ability and quality of meat. Yes, ultimately these animals, or at least some of them will provide nourishment to us and our families. Katahdins shed their wool in the spring, so I am not sure if the shedding wool can be turned into yarn or not. That will be something for Camille to research. below is a shelter I added on to the existing one that has some unwelcomed neighbors living inside. A massive hornets nest was built inside a bale of hay, so I have been unable to access the shelter, nor clean out the hay. 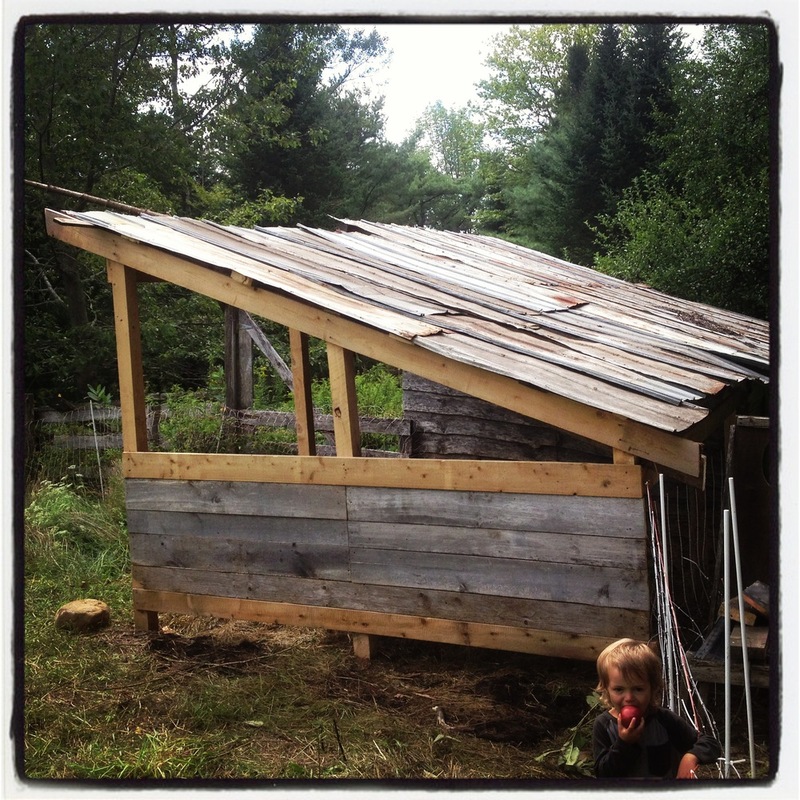 So, using wood and roofing tin found on the property, I constructed this shelter in just a few days. Before winter I will close it in and make it a warm comfy home for our new animals. The first few weeks has been exciting to say the least. They have escaped several times and once even made it about a mile away to our neighbors cow pasture. It took several hours of herding them, but we got them back, mainly with the help of Camille singing to them through the forest.